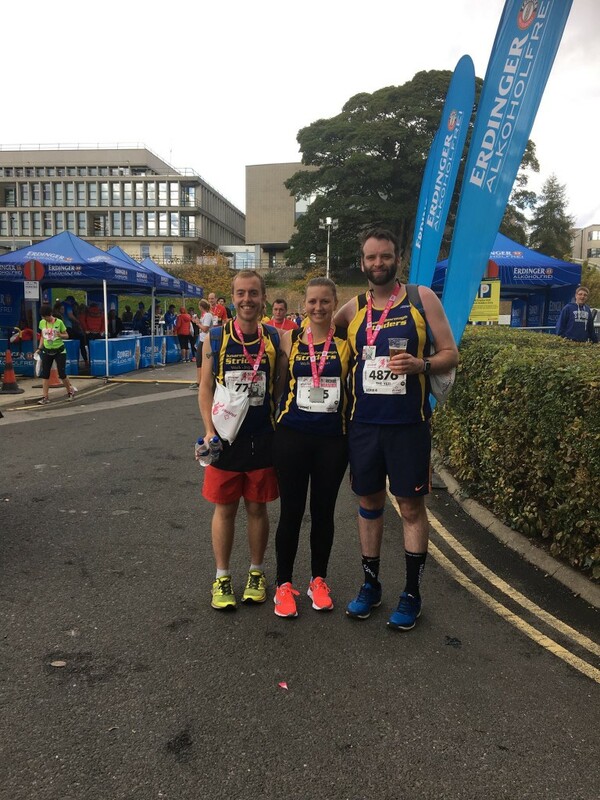 Whilst we work on rounding up the last 4 weeks of results, we wanted to make sure that we got todays out asap…..
Striders were well represented at the Yorkshire Marathon festival based in York on Sunday. The event comprised of a Marathon and a 10 mile event based at the University of York. Jonny Chadwick was the first of eight Striders across the line, recording a time of 03:30:45. Simon Rider was next in 03:37:12 and he was joined on the course by Graham Yare (04:03:21), Sean Brennan (04:08:35), Lisa Harrison (04:28:05), Mark Taylor (04:42:31), Mark Shelton (05:25:02) and Gemma Harding (05:27:11). In the 10 mile event, Julian Carr finished in a time of 01:24:49 to just beat his goal of 01:25:00. Following Julian was Georgina Townsend, who secured a personal best time of 01:25:57 over the 10 mile distance. Just over 10 minutes later was Sarah Hill who clocked 01:36:24 and she was joined by Kate James 4 minutes later after she completed the course in 01:40:41. At the London Royal Parks Half Marathon, Tom Calvert just missed out on a top 50 spot with his finish time of 01:22:11 placing him 59th out of a total of 16,455 participants. Niamh Falconer just dipped into the top 2000 and recorded a half marathon personal best with a time of 01:42:58. We have lots of other results to bring you from the last four weeks and these should be on the website in a few days time. Our annual Crag Rat Run race will be held on Sunday 1st October and we are requesting as many members as possible help out. Our next club social event is a Curry Night and will be held on Saturday 21st October at the Spice Merchant in Knaresborough. Information about the night (including menu options) is here. Menu choices and full payment (£12.95) is now due. A menu, menu choice cards and envelopes for placing choices and money into are available at the club house. Please hand to Natalie Hale or another member of the committee to secure your place. All payments must be received by 29th September to secure a place. Half Marathon Weekend….with a few parkruns thrown in for good measure! Three parkruns were visited by fourteen Striders this week but no one ventured to far! Gary Wilkinson travelled down the A59 to York and completed the flat course in 22:53 to record a course PB. At Fountains Abbey there was exactly 1 minute between the first two striders to cross the line. Niamh Falconer clocked 22:00 to finish ahead of FAbbey regular Derek Calvert (23:00). Bill Kirkpatrick, another regular visitor to this event, finished just over 10 minutes later with a time of 33:26. Harrogate parkrun was descended upon by 10 Striders who were led home by Ian Mitchell (20:51). Joining Ian were Stephen Morland (22:30), Nicola Carter (22:48), Paul Heywood (24:53), Julian Carr (26:15), Anthony Everitt (27:36), Edna Wood (28:26), Tracy Allison (28:30), Fiona Burniston (33:28) and Deborah Goldfield (33:42). Perfect running conditions greeted the 21 Knaresborough Striders in attendance at the Great North Run on Sunday. Tom Calvert secured a top 300 placing to lead the Striders contingent home in a time of 01:23:02. Joining him at the world’s biggest Half Marathon were James Wright (01:26:49), Dan Wilson (01:34:51), Jason Green (01:38:25), Simon Rider (01:42:32), John Slater (01:46:54), Dave Halliday (01:47:42), Debbie Herridge (01:57:51),Mark Taylor (02:00:18), Amy Naylor (02:08:35), Robert Whellens (02:14:38), Donna Rogers (02:16:00), Dawn Richardson (02:18:17), Sarah Hill (02:20:09), Kirsty Ramsey (02:20:16), Charlotte Hines (02:26:54), Lizzy Rose (02:36:26), Janet Morris (02:42:36), Steve Morris (02:45:34), Laura Bickerdale (02:54:58) and Emma Hodson (03:08:29). At the Vale of York Half Marathon, Guy Close secured a Personal Best over the 13.1 mile distance to finish in 01:24:38. Gary Wilkinson (01:47:28) was the next Strider across the line at the Sherburn in Elmet based event and was chased down by Zero to Hero graduate Claire Baxter who completed her first half marathon in 02:07:01 – amazing considering she hardly run at all prior to taking part in the Zero to Hero course in January! Christina Tremayne and Kirsty Jones ran the course together to stop the clock on 02:39:08 to complete the Striders line up. Look forward to seeing all of the t-shirts at training tomorrow night! In this weeks results round-up we have news from parkrun, the Derwentwater 15k, Blackshaw Head fell race, a Triathlon in the Lake District and two local 10k’s. We start, as usual, with results from parkrun…..
Harrogate parkrun welcomed 11 Striders on Saturday morning, including one whom recorded their 50th parkrun. Rob Earl was the first of the Striders across the line (18:41) and was followed by Ian Mitchell (22:23), Mark Taylor (23:26), Graham Yare (23:50) and David Halladay (27:08). Edna Wood (28:59) was the first lady Strider to finish and next was Paul Heywood (29:01) who ran his 50th parkrun (well done Paul!). Kate James (29:24) dipped under the 30 minute mark and was joined shortly after by Dawn Richardson (30:28), Gaynor Downs (31:28) and Jackie Knight (32:16). At Fountains Abbey Tom Calvert (17:38) collected the first place finish token. Niamh Falconer (22:06) held off Derek Calvert (22:49) and they were joined by Georgina Townsend (30:07), Bill Kirkpatrick (33:34), Alison Jackson (33:46) and Deborah Goldfield (36:32). Nicola Carter undertook some parkrun toursime, completing the Gibside event (based just outside Gateshead) in a time of 23:49. Two races were taken on by Striders members on Saturday. In the Lake District, Amy Naylor completed the undulating Derwentwater 15k event, which forms part of the Lakeland Trail series, in 01:57:46. 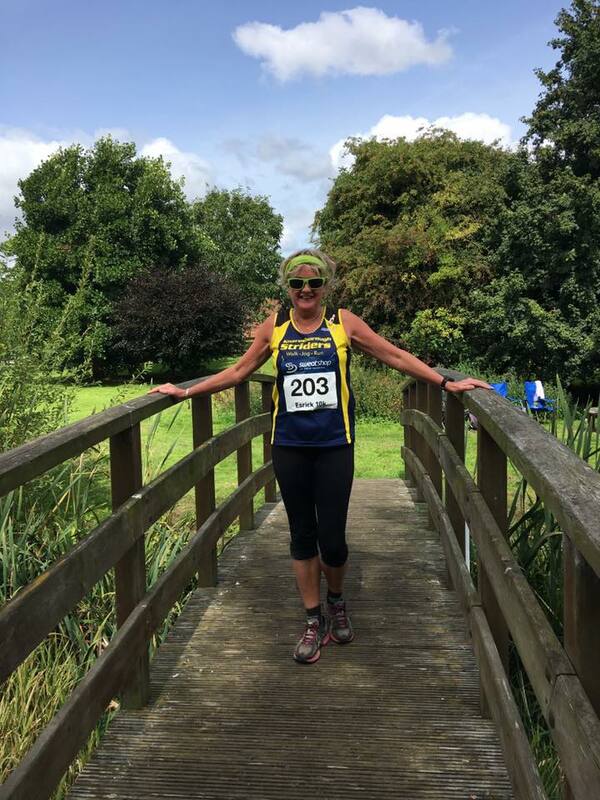 Sue Morley took on the Blackshaw Head fell race which is ran over an 8.9km route and takes in 274m of accent. Sue completed the challenging course in 01:00:19. James Warburton travelled to the Lake District, battling windy conditions with nearly 400 others in the Helvellyn Triathlon. Some strong performances, particularly in the run, saw him finish in a very creditable 26th place in a time of just over 3hrs 26mins. 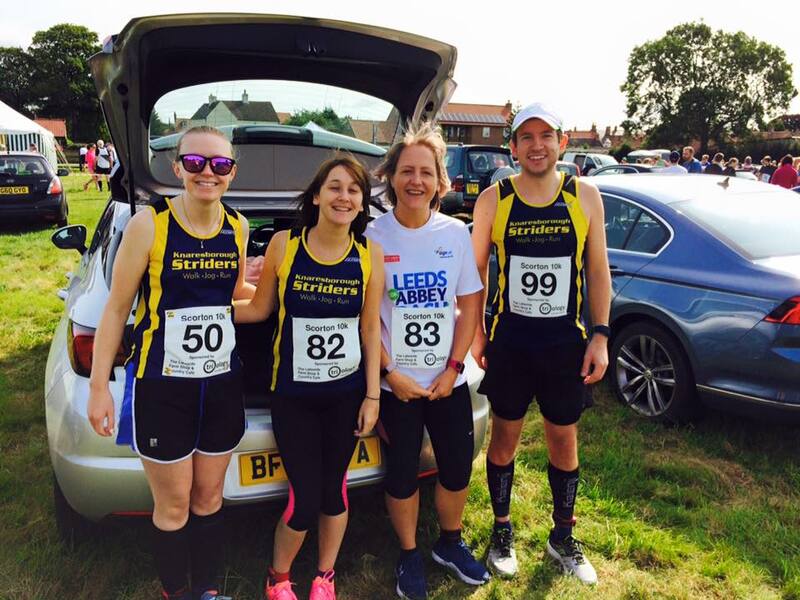 Striders were well represented at two local 10km races on Sunday – Wetherby and Tholthorpe. 22 club members headed to Wetherby to take on a course used by many as last minute training for the Great North Run. In a field of over 900 runners, some excellent times were posted with several personal bests beaten. Martin Brock led home the Striders contingent in 22nd place overall (37:48) with James Wright (39:34) also cracking the top 50, finishing in 41st position. Other finishers were James Ireland (40:10), Ian Mitchell (41:33), Stephen Morland (45:23), Simon Rider (46:02), David Halladay (46:26), Gary Wilkinson (46:36), Claire Killingworth (51:45), Julian Carr (53:17), Claire Baxter (55:09), Tony Everitt (57:03), Clare McKenzie (58:19), Deborah Goldfield (59:08), Vanessa El-Etriby (59:09), Tracy Allison (01:00:31), Dawn Richardson (1:01:33), Rebecca Williams (01:02:54), Claire Gott (01:02:55), Laura Wilmshurst (01:03:47), Annika McDonald (01:09:33) and Jo Gray (01:19:07). Pictures from the event can be found here. At Tholthorpe, four Striders took on the 10k route with James Cornforth finishing 13th overall in a time of 39:11, followed by Phil Cornforth (46:28), Paul Heywood (52:14) and Edna Wood (58:45). We start this week’s round up with some results from some recent Triathlon events taken on by James Warburton. On Saturday 12th August, he participated in the Howgills Triathlon and took 5th place overall in a time of 01:49:50. On Sunday 20th August he completed the ‘Half Cheese’ Triathlon in Wensleydale, taking the 3rd place trophy home with a finish time of 02:16:06. Sue Morley competed in the ‘Burnsall Classic’ fell race on 19th August. This 1.5 mile race may be short but it has a total climb of 900ft!! Sue recorded a time of 27:40 – top work! This week the Striders were represented at six different parkruns. We will start with the furthest away and work our way back…. Claire Baxter visited the Rushmoor event in Aldershot and completed her 7th different parkrun in a time of 27:29 to record an overall parkrun PB. At the Druridge Bay event, which is based near Morpeth in Northumberland, Jackie Knight completed the course in 32:33. Guy Close took on Keswick parkrun for the 2nd time, recording a PB time of 18:29. Six Striders visited Catterick and were led home by James Cornforth (17:59). James Ireland (18:12) was next to complete the 3 lap course, followed by Claire Killingworth and Georgina Townsend who both clocked 24:21. Julian Carr continued his comeback from recent injury to complete the event in 24:56 and he was joined by James Wright who finished in 24:58. Fountains Abbey was visited by eight Striders. Conrad Garcia (21:42) was the first back across the line, followed by Derek Calvert just over a minute later (22:47). Edna Wood and Paul Heywood finished in the same time of 28:47 and they were joined by Stella Jones (30:06), Dawn Richardson (30:37), Gaynor Downs (32:03) and Deborah Goldfield (32:14). At Harrogate, Martin Brock secured a PB of 18:19 to fend off the challenge of Robert Earl (18:46). 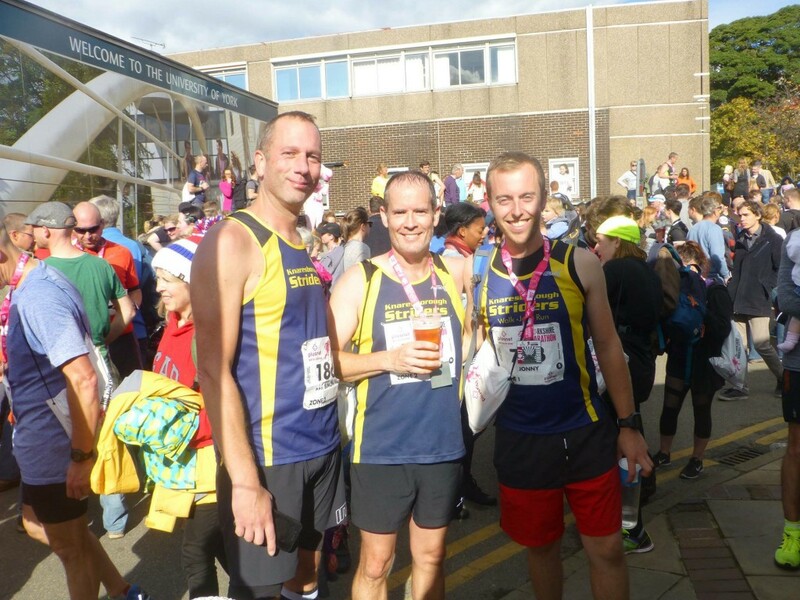 Next back was Ian Mitchell (21:16) and he was followed by Stephen Morland (22:30), Anthony Everitt (27:30), Jen Carne (28:22), Tracy Allison (29:01) and Mark Taylor took on pacing duties to finish in 29:57. For those who have put their name on the list for the Xmas Party (Swan Hotel, 16th December), a deposit of £10 is required by Tuesday 29th August to secure your place. Cash (in a marked envelope if possible) can be given to Clare Rogers on Tuesday evening at Striders session or a BAC transfer can be undertaken (but must be done by 12Noon Tuesday). If you do not have the Striders bank account details, please email us at info@knaresborough-striders.org.uk. If you haven’t already got your name on the list…..what are you waiting for?! Send us an email to get on the list! Inov8 will be at the club on Tuesday 22nd August to give all of our members the opportunity to try on a pair of the latest trainers available on the market. Come down to the club a little earlier then usual to have the best selection of shoes and sizes – ‘doors open’ at 7pm. Three parkruns were visited by Striders this weekend and we start with results from the Temple Newsam event just off the M62 near Leeds. Ralph Weldon secured a time of 25:24 and was joined by Annika McDonald who bagged a PB in a time of 33:36. At Harrogate Rob Earl (18:57) once again led the Striders around the Stray. Ian Mitchell was next (22:06) and just held off Nicola Carter (22:16). The next four Striders were split by only 19 seconds overall – David Halladay (26:56), Mark Taylor (pacing – 26:58), Julian Carr (27:01) and Anthony Everitt (27:15). Tracy Allison was the 8th Strider across the line (27:54), with Lauren Downs (37:22) completing the Striders line up. A special well done to Julian as this was his first parkrun back after his recent knee operation. Over at Fountains Abbey Tom Calvert took the 3rd place token with a time of 17:51. Derek Calvert, who recently completed his 50th parkrun, completed the course in 22:5, with Samantha Curnow (23:16) and Bill Kirkpatrick (33:54) joining him at the ever popular event. A warm Sunday morning greeted Striders taking on the Escrick and Scorton Feast 10k events. At Escrick, Ian Mitchell ran a strong race to finish in 44:00 precisely. Paul Heywood was next, finishing the multi terrain course in 53:17 and he was chased down by Edna Wood (01:00:48) and regular Escrick 10k participant Dawn Richardson (01:02:35). Up the A1 at Scorton, James Wright (41:22) headed a Striders contingent of four. Claire Killingworth secured a 10k PB with a time of 53:4 and was joined at this great local event by Donna Rogers (54:23) and Clare Rogers (01:05:20).